Thank you for joining me as we count down to the MFT release. We are four days away from the big day! All the new Stamps, Die-namics, and Stencils will be available on Tuesday, April 4 at 9:00 pm EDT. Be sure to check out the MFT Blog to see all the new items being revealed today. Don't forget to leave a comment on the MFT Blog countdown posts, YOU could win one of the five $75.00 gift vouchers. This new Birdie Brown set may be too cute for words! I am in LOVE! The Up in the Air stamp set and Die-namics is full of adorable creatures sized perfectly to fit in the hot air balloon. Of course I had to use the puppy image first. The images were all stamped on X-Press It card stock and were colored with Copics, and the background was airbrushed with Copics. The fabulous patterned paper is from the Black & White Basics paper pack. I finished off the card with a pop of Wild Cherry card stock and the stitched sentiment strip. Awww Julie, this is precious! Loving this balloon set! 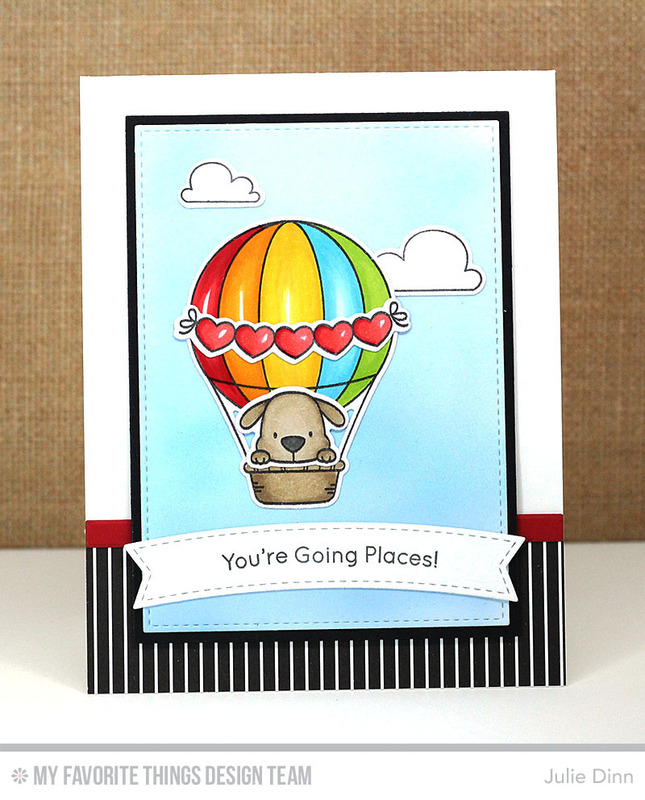 Love your cute card and that little bear is adorable in the balloon! You created a terrific base to show off the hot air balloon and puppy going places! Fun card - perfect for many types of celebration. Awww,too cute. Working some black into the card base really sets off the colorful balloon. Love the pooch in the hot air balloon! Delightful card. . .the black and white backdrop for your colorful piece works so well. Thanks for sharing this.